« The truth behind the picture…..
…it’s so French! Can anyone tell me why these are called French Doors? Well, whatever the answer it took a big leap for me to add any doors, French or otherwise, into our large open plan living space. The thing that clinched it was the amount of heat that leached out of the Assembly room (our lounge) even when the wood burning stove was belting out heat at 10kw. That equates to a LOT of wood every evening it was lit and it seemed the right thing to do. I was fortunate to find two sets of matching interior Georgian-style French doors and a single door online; that was £80 for 5 doors which is a bargain in door terms. The first set have now been installed in the large opening to the kitchen. 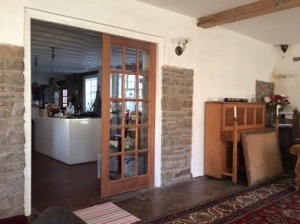 The two smaller arches have been framed, boarded and plastered and the other large opening was the first to be closed in about two years ago to allow the range cooker to be installed against it in the kitchen. This has made the Assembly room the first room in the downstairs to be enclosed for well over 100 years. The doors are big enough to open wide and allow easy wheelchair access and so far I have only driven into the door once – on day one! It has certainly changed the look AND feel of the house and on a very positive note it is wonderfully cosy and warm even if the fire is not lit; a really big improvement helped by the restoration of the five sash windows – no more drafts!